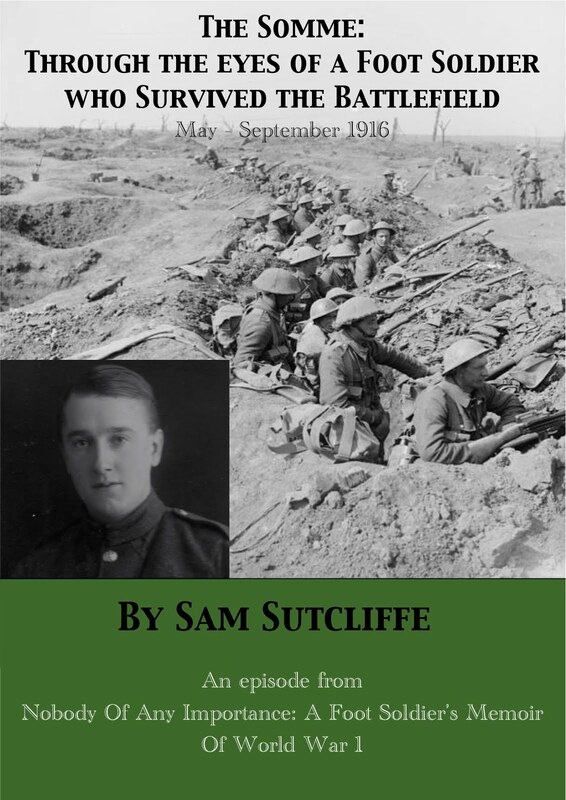 A blog dedicated to the World War 1 memoir written by Sam Sutcliffe, an ordinary soldier who fought at Gallipoli, the Somme and Arras. He wrote Nobody Of Any Importance - his title - in his 70s from his remarkable near-total-recall memory. Book and blog edited by his son, Phil. August 1914: young Sam the joker finds "they didn't have a laugh left in them"
A hundred years ago… following the terrible first British defeat at Mons, in Belgium, near the French border, the BEF continued its retreat. It fought rearguard actions at Le Cateau August 26 (13,000 wounded and dead, British and German) and Etreux August 27 (three companies of the 2nd Royal Munsters, outnumbered 6-1, delayed the German advance for 14 hours). But the 28th saw the first British victory – in the first naval battle, at Heligoland Bight (six German vessels sunk, 712 dead, and 35 on the British ships). Meanwhile, war swiftly circled the world in ways I never heard of till I edited and researched around my father’s Memoir: on the 27th, Japanese and British fleets attacked the German-held port of Tsingtao, China; today, the 30th, is the centenary of New Zealand successfully invading German Samoa. “The old boy’s train home went from Liverpool Street too so Tommy… was permitted to walk with him… Tommy strode out to keep step. Comical he must have looked in his skintight trousers and short, bum-freezer jacket, topped off with the square, bowler hard hat. “Men like him knew and maintained an expected code of conduct – although, curiously, they had, and they showed, contempt for anyone of their own class who attempted to improve their status by study and hard work. Yet these old and trusted servants also felt they were themselves aping the gentry and becoming traitors to their kind thereby — if one can follow that line of thought. Many a tirade on these matters assaulted Tommy’s ears. Sergeant in his lunchtime strode the office floor: a bite of his sandwich, a champing of the jaw muscles, a long swig from a tankard of beer, and out flowed the bitter words. [Company Secretary] FCB, and Sampson, head of accounts, and Otley, the top draftsman, all came in for it, the last classed as a ‘homo’ as well as an upstart. “On one occasion, Tommy tried to introduce a little fun into the now gloomy life at the office. On the street outside the company building a newspaper deliverer stopped him – they dashed about the City on bikes with high handlebars and low saddles. The painful consequences… poor humour, coarse humour. Tommy laughed heartily. But he had to tell the man, ‘I’ve got no money, I can’t buy it’. However, at home that evening, he found a piece of sandpaper and a piece of card, pinned them together, wrote this elegant rhyme inside, and took it to the office next morning. Next week: Sam joins up. A hundred years ago yesterday… August 23, 1914, three weeks after Britain declared war on Germany, the British Expeditionary Force – the nation’s established professional Army – fought its first great action in defence of “little Belgium”: the Battle Of Mons. They fought valiantly, they deployed their brilliant 15-aimed-shots-a-minute marksmanship so skillfully they often fooled their opponents into thinking they had adequate numbers of machine guns. But they lost and a two-week retreat began. Back home, boys like my father, Sam Sutcliffe, 16 – living with his family in Edmonton, north London, working as a junior office boy in mining company Lake & Currie’s City HQ – heard little of this bad news for some while. However, he writes, they “all felt the same – that life as they had known it was finished, big things looming”. So, during this interval of worrying and wondering, a look at the life my father saw around him as he traveled daily from a poor family home into the wealthy heart of London. “A day or so beforehand, Tommy had to visit the supplier to hand over the order – often at a famous restaurant and bar over in Cheapside called Sweetings [Queen Victoria Street] where he observed really prosperous City businessmen, bosses all, who wouldn’t even spare the time to sit down to have their lunch. These toffs, as Cockneys called them, clad in fine morning suits, lined the long counter, munching, and drinking their ale or whatever they favoured. The smell of all these delicious foods pleased Tommy; he loved to stand there and look and breathe it in. White-hatted waiters dressed up as chefs carved succulent slices of beef or ham. In addition to the special drinks and foods the restaurant supplied, Tommy had to buy certain cheeses and a special type of coffee. This task took him to a shop of the old style where soft cream cheeses hung from the ceiling in muslin bags… Fortunately, in due course, Tommy would get the chance to do more than look at all this enticing provender. When one of these feasts had concluded, the bosses would take their guests to a club… Often, when they left Mr Lake’s office – the temporary dining room – Tommy went in to clear up before the caterers came to collect any utensils and crockery they had provided. But he’d pause to inhale the fumes of cigars and cigarettes, the aroma of all this good food, and of an appetising cocktail they regularly took called gin cup which they drank from small, silver tankards, a sprig of a small, mauve flower with a yellow centre floating in each one. A hundred years ago… And two weeks on from the German invasion of Belgium, Great Britain's immediate declaration of war on Germany, that lights-out night, hardly a shot fired in anger for another few days, and meanwhile the country seethed. Every head full of heroic fantasies or terrible fears, the former much talked about, the latter less so. Company Secretary F.C. Bull, with knowledge to back his forecast, made no attempt to conceal his pessimism with regard to those companies owning property in Africa and Asia whose affairs he handled. German submarines would cripple our sea transportation, said he, sagely. Most people thought it would be a short war, 'all over by Christmas'. The minority, like F.C. Bull, who read and listened to those with some real knowledge of the situation, knew the struggle would probably be long and difficult. Pessimists even gave reasons why, if we weren’t careful, we might lose this war. They reminded one that the royal family bore the German name Guelph, their origins Hanoverian. And they would argue sarcastically that the Army was all ready to fight… the Boer War again! Such opinions, of course, offended the loquacious patriots — 'Treasonable,' said some." "Schools now had to teach children the anthems of Britain’s allies — in English, except that, in grammar schools, they sang The Marseillaise in French. The Belgian national anthem became familiar to all. So did the Russian. Gradually a feeling grew that we were one of a group of nations and this gave a sense of confidence. Rumours of large numbers of Russian soldiers seen on trains travelling through the English countryside spread and reinforced this optimism — the joke was that Russia had dispatched these soldiers so quickly they still had snow on their boots." "On the train each morning, the four lads discussed the latest news, telling each other about chaps who had either been recalled to their units or had volunteered to go. They talked with both excitement and unease. Confused emotions pervaded them and everybody around them. One morning when Tommy got to work he heard that young Breeman had joined up – the chap in the accounts office he admired so much. Tommy thought what a splendid officer he would make, a good physical specimen, mentally alert at all times. But the gap in the ranks at the office only increased that sense of unease, that something was wrong somewhere…"
* In fact, the Government did not introduce conscription until January, 1916; the extraordinary wave of volunteerism met the war's demands until then. Next week (probably; there's a lot going on): some FootSoldierSam verbal snapshots from brink-of-war London life 1914 – for the workers and the wealthy. The Spring Offensive battle at Arras, Sam's eight months as a prisoner, Armistice as a POW, the trek back to France, hospitals and breakdowns, the peace at last. To buy direct contact philsutcliffe47@gmail.com Add to Cart for Paypal button to be added ASAP! or for Amazon click the cover image. £1.50. To buy FootSoldierSam's full Memoir as an e-book from Amazon click below. 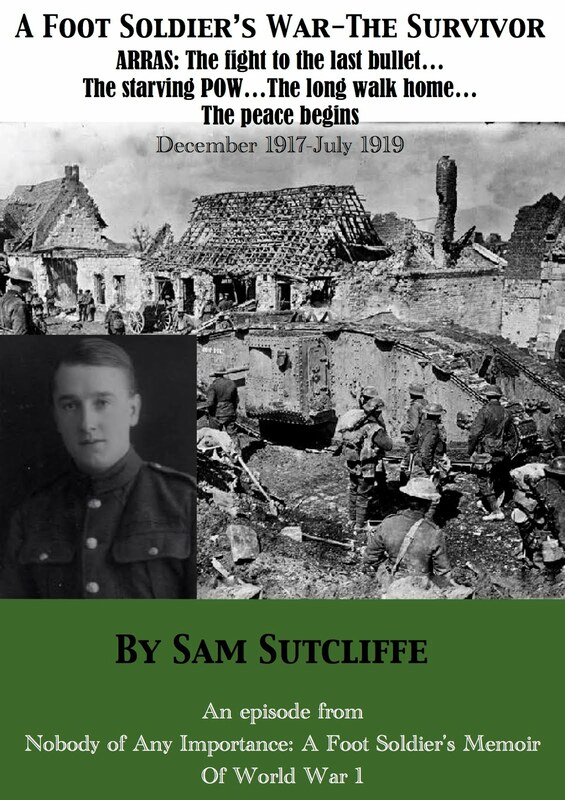 Sam on the Somme Front - e-book excerpt from his Nobody Of Any Importance Memoir. To buy direct, contact philsutcliffe47@gmail.com or for Amazon click the cover image. £1. An episode from Sam's Nobody Of Any Importance Memoir. To buy direct, contact philsutcliffe47@gmail.com or for Amazon click the cover image. £1. War declared – Germans in England "disappear"
Sam on the Somme, July 1 looming, reluctantly dons his extra stripe, survives another hair-raising night in No Man’s Land… and comes upon school children at play within shelling distance of the Front! 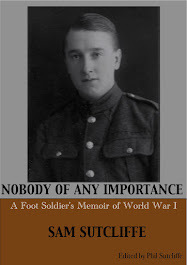 * Nobody Of Any Importance Paperback: now available either through me (Sam’s son Phil) or through Amazon as detailed on this blog - see right-hand column. It cost £4 per copy to print so the Red Cross gets £6 per paperback bought directly through me. You're welcome to pay through PayPal but that cuts the donation by about 64p. P&P is charged at cost – padded envelope 30p, 2nd-class postage currently £2.80 in UK. If you buy the paperback through Amazon , after their fees, print costs and P&P are deducted the Red Cross will get £2.53 per copy. * Nobody Of Any Importance e-book: if you buy direct from me via philsutcliffe47@gmail.com the whole £5 will go to the Red Cross – paying via PayPal reduces the donation by 37p; if you buy through Amazon the royalty which goes to the Red Cross is £2.80. 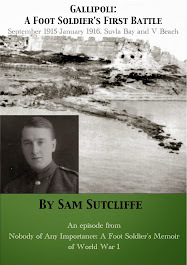 * Gallipoli: A Foot Soldier's First Battle and The Somme: Through The Eyes Of A Foot Soldier Who Survived The Battlefield e-book: if you buy direct from me the full price of £1 will go to the British RC – paying via PayPal reduces the donation by 23p; if you buy through Amazon the royalty going to the Red Cross is 29p. Any queries, you have my email address. Copyright © Sam Sutcliffe 1987 & Phil Sutcliffe 2014. The moral rights of the authors are asserted.. Picture Window theme. Powered by Blogger.